‘Lanterns for Peace’ (8 August, 2010, ‘Third Coast Digest’) | Industrial Strength Publicity, Ltd.
Lanterns for Peace, an event sponsored by the Peace Education Project of Peace Action Wisconsin, was held Saturday, August 7th at the Friends Meeting House on North Gordon Place in Milwaukee. Workshops were held on a variety of environmental and nuclear-disarmament related issues to commemorate the atomic bombings of Hiroshima and Nagasaki. Inside the Meeting House, a performance including African, modern, and interpretive dance was put on by Youth Dance Circus, where four African-style drummers kept the beat with handmade instruments. The talented teens, we were told, learned the moves to all of these dances (which they performed flawlessly) in a 4-week dance camp that had been held in July. Afterward, Julie Enslow of Peace Action Wisconsin gave an informative and emotional speech on disarmament topics that also invited everyone in attendance to act. “This isn’t all about floating lanterns and remembering, it’s also about acting,” said Enslow. She encouraged us to recall past tragedies and try to prevent them from befalling us again.Chuck Baynton of PAW’s Disarmament Committee addressed the crowd, speaking about the grave implications of world that cannot move beyond war. “What we’re talking about preventing now is something that would destroy civilization in an afternoon,” said Baynton. 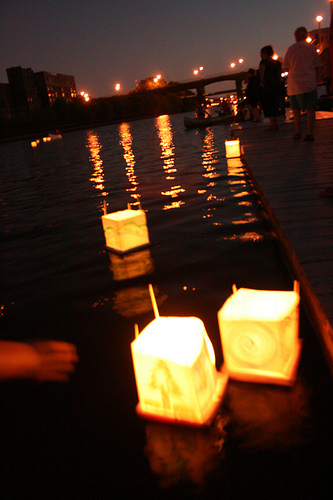 At dusk, we made our way to the Milwaukee River, where small candles were placed inside the recently constructed lanterns, lit, and set afloat on the calm waters. Statistics regarding the deaths attributed to nuclear weapons were given as the canoes were packed up with the lanterns and rowed out to the middle of the river. We set the lanterns in the peaceful waters in remembrance and in respect, and maybe, in a sense, as an apology for actions we ourselves were not even responsible for. The annual event uses a tradition that was imported from Japan and is held in many cities throughout the world to remember 1945′s atomic bombings of Japanese cities Hiroshima and Nagasaki during the ending stages of World War II. These nuclear explosions, ordered by President Harry S. Truman in August of that year, resulted in the deaths of 90,000 – 166,000 in Hiroshima and 60,000 – 80,000 in Nagasaki (most of which were civilians), approximately half of which occurred on the days of the incidents. The rest of the fatalities took place in the following months and were results of the effects of burns, radiation sickness and other injuries. Peace Action operates with the stated goals to “abolish nuclear weapons and power, end military intervention, stop the international arms trade, and transfer military spending to meet human needs.